rec. live, Arlene Schnitzer Concert Hall, Portland, Oregon, 2013/14. A couple of years ago Carlos Kalmar took the Oregon Symphony through their paces in a programme of English music which John Quinn liked (PTC5186 471 – review). Now they are on home territory in excerpts from two live concerts and even more effective. The opening work, Piston’s suite from The Incredible Flutist, is hardly typical of the composer’s music: it’s much more approachable, deliberately intended for fun, and it receives a suitably approachable performance here, circus-style cheers, barking dog and all. Though I find much of Piston’s music hard to cope with, I prefer to get my teeth into that meatier fare. Antheil’s Jazz Symphony, though here presented in its 1955 revision, is imbued with the spirit of the 1920s: if you like Milhaud’s Le Bœuf sur le Toit or Ibert’s Divertissement you’ll enjoy it. There’s plenty of competition for the Piston but there are only two rival versions of the Antheil, both part of all-Antheil programmes and both well worth considering: CPO 777 109-2 and Nimbus NI2567 – review. If I say that Copland’s Third Symphony is the greatest American symphony, that has to be qualified by the fact that it’s the first that I ever got to know, from Copland’s own recording when it was released by World Record Club, many moons ago (Everest SDBR3018 – review – review), and that my knowledge is limited to symphonies by Still, Ives, Copland, Piston and Harris. I know there’s more out there to discover but I can’t imagine any of it trumping the Copland. I refreshed my memory of that Everest recording for comparison, together with Leonard Bernstein’s DG recording (review), now available as a download only (with Quiet City, from 7digital.com in mp3 for £4.95 or Presto in lossless for £11.11, no booklet with either, or with the streamed version from Qobuz). I also listened to Bernstein’s earlier CBS recording, as streamed via Qobuz from the last Sony release, with the Organ Symphony: that, too, has been deleted. Though the Everest recording set the benchmark, the label has been in and out of availability – mostly out – so many times that one or other of the Bernstein recordings is more likely to have been your introduction. Both still sound remarkably well, as does the Everest. It’s a tall ask to expect the new recording to match up to these predecessors, but it does so to such an extent that I would be very happy to have just the new PentaTone. Though not usually regarded as in the first rank of world orchestras, the Oregon players are well up to the challenge of the LSO (Everest) and NYPO (Sony and DG). I don’t know if any splicings were made from rehearsals, but these are live recordings and very good they are, with no allowance needing to be made. It would hardly be surprising if Kalmar had studied the earlier recordings which I’ve mentioned. Certainly his interpretation is broadly in line with Bernstein in particular: he’s a shade faster than the DG, but so was Bernstein on CBS, as was Copland himself. Every facet of this multi-faceted work is well captured on this new recording. The PentaTone recording is excellent, especially in 24-bit form, and there’s a very useful set of notes in the booklet. I also listened to the mp3 and that, too, is very good of its kind, which means that if you don’t want to go the extra mile, dollar and cent for the 24-bit, the 16-bit should be so too. I haven’t been able to hear the SACD, but from past experience of comparing the two formats that should be equivalent to the 24-bit download. You can also stream from Qobuz. With the two Bernstein recordings out of the picture on disc, only the fairly recent return of the Everest recording prevents me from making the new recording my version of choice. No sooner has it returned, however, than it’s become elusive again, especially in the UK: Amazon UK are asking £84 for their one copy and Amazon US offer it for $9 but you have to order it and wait for a CDR copy to be made. The easiest way to obtain it in the UK is to download from iTunes (m4a, so you may have to use a conversion programme to play other than on an Apple device. £5.99 with pdf booklet). If you are looking for a bargain version and an all-Copland programme, James Judd on Naxos may well fit the bill (8.559106, with Billy the Kid – review; also in 24-bit format from 2xHDNA2030 – DL News 2014/9). The new PentaTone recording stands up well to all the competition, however. If you can’t be bothered to chase up the elusive Sony, DG and Everest versions and if the couplings appeal I see no reason why you should not go for it. I came close to making it a Recording of the Month. 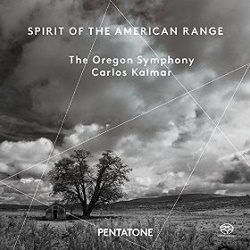 I've heard and admired two previous Pentatone releases from Carlos Kalmar and the Oregon Symphony (review ~ review). Like the two earlier albums this disc consists of performances recorded in concert in the orchestra's home venue. I'm not entirely sure that George Antheils Jazz Symphony sits too comfortably in a programme that bears the title, Spirit of the American Range; surely, it is urban music. Originally composed in 1925 it's presented here in the 1955 revision. The revision, in the pithy words of the American musicologist, Matthew Mugman, shortened and tamed the original score. The revision is a few minutes shorter and calls for a significantly reduced instrumental ensemble. It's a deliberately brash piece, painted in defiantly primary colours. It's not profound - and I struggle to see how it justifies the term "symphony" - but it's extrovert and entertaining, which is how it's delivered here. The Incredible Flutist was Walter Piston's only stage work. The ballet was composed in 1938 at the request of Arthur Fiedler and shortly afterwards Piston compiled the present suite, which was premiered by Fritz Reiner and the Pittsburgh Symphony in 1940. I like Piston's music but he can seem a bit correct and dry at times. Not so here. The Incredible Flutist is colourful and thoroughly engaging which makes it a cause for disappointment that the composer never again essayed a theatrical score. The one regret I have about this present recording is that Pentatone have not tracked separately the 11 short sections of the suite as was done, for example, on Gerard Schwarz's Delos 1992 recording (review) and also on the 1989/90 RCA recording by Leonard Slatkin. The performance itself is very enjoyable. The slow and seductive Tango of the Four Daughters (4:20) is warmly played and the arrival in town of the circus and the subsequent march are delivered with relish. In the march those members of the orchestra who are not playing are invited to cheer/. The crowd of bystanders� is highly enthusiastic here, so much so that I wondered if the audience had been invited to take part but perhaps not; there's just as much racket accompanying the Schwarz and Slatkin parades. The Flutist's music (9:01) is presumably entrusted to the orchestra's principal, Jessica Sindall, who makes a lovely job of the snake-charming episode. Later on I like the flamboyant sway that's imparted to the "Spanish Waltz" while the following Siciliana swings nicely. I enjoyed this performance very much. The very opening of the symphony evokes the vast spaces of the American Outdoors and the plains. There's an epic feel to quite a lot of what follows and also, I think, a sense of determination. This movement is very well presented here - I particularly admired the delivery of those passages that evoke the Great Outdoors. The second movement is vigorous and energetic and Kalmar and his players put that across very well; there's often cheekiness in Copland's rhythmic writing and that comes out here. The trio presents an opportunity for sensitivity and the Oregon strings and winds step up to the plate. The strings distinguish themselves in the slow movement. That said, all sections of the orchestra do well in this thoughtful music. Kalmar conducts with sensitivity and I especially liked the poetic transition to the finale. It's here where the Fanfare for the Common Man comes in. The woodwinds announce it gently and then (0:49) comes the familiar brass and percussion scoring. It's most imposing here, the music's cause aided by the splendid recording. The Allegro risoluto that follows has the Fanfare as its primary source; the present performance is a very spirited one. The music gathers a seemingly irresistible momentum but what are we to make of the grinding discords that stop the merry dance in its tracks? (8:57) I suspect it's Copland's way of reminding us that while in 1944 an impending victory and peace were causes for celebration the victory had been won at a cost - the loss of many common men. The apotheosis of the Fanfare (from 10:50) may seem a touch grandiose but, again, we must remember the times in which the music was written; I'm convinced. This very fine Copland performance caps an admirable and thoroughly enjoyable disc. All the music is impressively played and impressively engineered too. The recording came in for praise in the MusicWeb Listening Studio recently and I got equally satisfactory results when I played it on my own equipment. The recorded sound has good perspective and sonic depth. The percussion -especially the bass drum and timpani -register with realism and impact. The brass sound resplendent while the strings and woodwind have a pleasing bloom to their sound. Engineers John Newton and Blanton Alspaugh have done a fine job. My only minor criticism of this release is that the notes about the music are a bit superficial. Incidentally, though these are live recordings the audience is commendably silent and there's no applause at the end of the performances. This impressively engineered SACD is another fine advertisement for Carlos Kalmar and the Oregon Symphony.